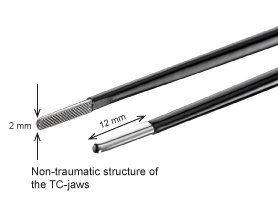 The non traumatic structure of the TC-jaws bipolar forceps enables precise powerful grasping, or gentle grasping and manipulation of tissue with simultaneous bipolar coagulation. A full range of bipolar cables are available to fit the bipolar forceps to your generator. A full range of bipolar cables are available to fit the bipolar forceps to your generator.